Tyler and I didn’t spend a lot of time choosing the locations for our honeymoon in Italy. The Amalfi Coast was an obvious choice with its staggeringly beautiful coastline and romantic atmosphere. I had been to Rome once before, loved it, and knew Tyler would be completely obsessed (we’ll talk about that later). And then there was Venice. 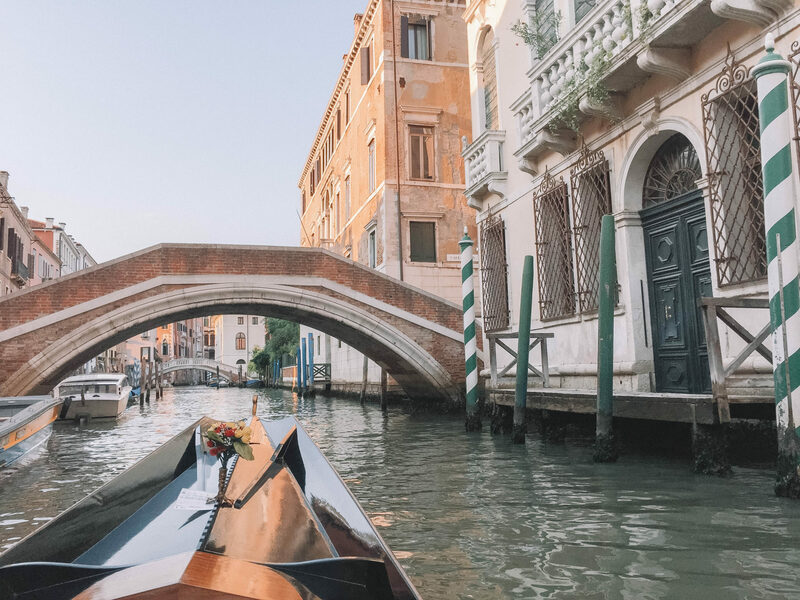 What could be more romantic than gliding through historic canals on a gondola and getting lost in its quaint, car-free walkways? Venice was the perfect finale to two weeks of newlywed gallivanting. We labored and schemed over every detail (very us) and thought we couldn’t have planned a dreamier trip. And it was perfect, almost. Amalfi was incredible, Rome was Rome (see this site’s URL). And Venice was… different than what we expected. Before I start making enemies, just hear me out. Venice is enchanting. It is truly a unique city that I do think is worth seeing at least once. And we had an amazing time. I would hop off a vintage water taxi and step onto the dock looking like Blake Lively with flawless hair and makeup, obviously wearing a floral maxi dress and strappy sandals. Tyler would immediately find us a charming table at an outside bar on a canal. We’d spend the rest of the weekend sipping Spritzes and would have the city to ourselves to uncover. Unfortunately and not surprisingly, this little dream of mine fell to pieces the second we arrived in Venice. First of all, the “vintage water taxi” (I literally do not even know where I got that) turned out to be a claustrophobic, insulated water BUS, crammed with around 323 people and each of their 3.5 suitcases. I spent 30 minutes in a sheer panic before the boat dumped us into the little streets of Venice. We spent the next hour completely lost (not in a glamorous way) and trying to find our hotel through the hoards of people. The sticky weather and stickier crowds put a swift halt to my dreams of floating around like a movie star. The only way I can describe how I looked in the 400% humidity was like a sweaty, electrocuted lion. We knew that Venice would be crowded. We were, after all, going there in August (the peak of the high season). We naively thought it wouldn’t matter because we’d be on our honeymoon and on cloud nine. We had NO idea that it would be elbows-up human-wading for 48 hours straight. Cruise ships dropped what seemed like thousands and thousands of people off each day. The city did clear up a bit at night, so we waited until later in the day to start our exploring if we could. 28 MILLION tourists stampede through the tiny, fragile walkways of Venice (whose own population is just at 55,000) each year. Venetians have taken measures to slow this traffic over the past couple of years. In fact, they may even ban cruise ships from docking at the city in the future. There are just too many of us storming through this historic and delicate city. This brings up a discussion that is probably better for another day about how we can travel more ethically. I recently came across this article that talks about places around the world that are now actively taking steps to slow tourism down. Very interesting, but I digress (for now). The point I was getting at here is that Venice is just a complete nightmare in the summertime. It’s crowded, it smells, and it’s just SO claustrophobic. Oh, and those Spritzes that everyone posts on Instagram? Horrid. BUT. We CAN see how magical it would be to go in colder weather when it’s not so overrun. Venice is mysterious, iconic, and ridiculously photogenic (it’s too bad we were on that pre-travel blogger iPhone 5 game at the time). Even the deterioration caused by water damage and decades of stomping tourists looks romantic. We recommend planning a trip during the off-season when you can explore without having to play fullback and block incoming tourists for your significant other. Ultimately, though, we did have a fantastic time exploring. We went through our itinerary and narrowed down our favorite things to do in Venice. Do your best to visit St. Marco’s Basilica and the piazza first thing in the morning before the deluge of cruise passengers. It is worth it to visit this beautiful cathedral, but Saint Mark’s square is definitely the center of the action. Beware of sky-high prices at the cafes in the piazza and try not to step on a pigeon. Are you traveling with a book-lover? Perhaps you are a bit of a bibliophile yourself? If the answer is yes to either question, empty your daypack and prepare to fill it with used books from Libreria Acqua Alta. I am an avid reader and routinely force Tyler to watch me peruse used bookstores. I have to say that the Libreria Acqua Alta (or “Book Store in High Water”) in Venice is so quirky and definitely one of my favorites. The store gets flooded every winter, so they keep books in tubs, bathtubs, and even little boats to keep them dry. Taverna Al Remer is a tiny bar that is tucked out of sight, making it ideal for dodging those “other” tourists. The happy hour includes a spread of complimentary appetizers to pair with your drink. Grab a seat on the canal and watch the sunset with some locals. And yes, it took us about 30 minutes of wandering to finally find this place. This is, without a doubt, the most touristy thing we’ve ever done. It costs €80 for a 40 minute ride. I know, ouch. But it was our HONEYMOON for goodness sake. We packed a bottle of bellini to sip on during our sunset ride, and our gondolier sang to us in Italian. If you are going to make a trip to Venice in your lifetime, the gondola ride is a must. When Tyler and I travel, we try to not go to the same place twice. Our Airbnb host recommended we check out 6432 a le Tole, a cozy restaurant down the street from our apartment. As soon as we saw the staff hand-rolling pasta from the window outside, we knew it was game over. The gnocchi here was easily the best we’ve ever had (I mean, do we strike you as the type of people who don’t take gnocchi WAY too seriously?). We couldn’t help ourselves and had to run it back our second night. PLEASE go here. You might know by now how Tyler and I approach museums (e.g. Amsterdam and Vienna). But in Venice, we took our high class culture game up a level and attended a Vivaldi quartet at the Church of San Vidal. We purchased 30€ tickets ahead of time for an evening show. The concert was incredible, and we highly recommend it. Although we will likely not go out of our way to visit again, we loved our time in Venice. It is truly unlike any other place we’ve been. If you are thinking about visiting, definitely plan around the crowded and hot high season. Then let us know how it goes and if you think we do need to plan another trip? Definitely doing the exact same things you guys did when I go!!! Love!!! Your dresses are perfect too! I resisted going to Venice for ages since I’d always heard how crowded/hot/humid it was in the summer, and crowds plus heat turns me into a crazy person. Not fun. But finally a couple of years ago I booked a long weekend there right at the beginning of January, and ahh, bliss. This was the Venice that I had imagined. Quiet, mysterious and foggy in the mornings, and… freaking freezing cold. I have never felt so cold in my life, but I also packed a woefully inadequate coat because I assumed it couldn’t possibly be that much colder than Rome, right? Wrong, obviously. I will definitely return to Venice, but only in the depths of winter when tourist avoidance is totally possible! Thank you for blogging your experiences. I have been going through every article you have on Europe, and have yet to find the one in the title… Rome ^_^ Going there for our honeymoon in July. You two are travel- and relationship-goals. Thanks again!